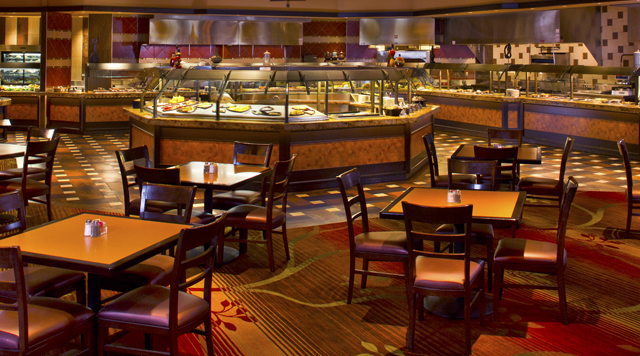 One bit of advice when you visit The Kitchen Buffet: come hungry! Here, you can choose from a wide arry of delicious options such as roasted chicken, chef-carved meats, pasta, soup and salad bar, decadent desserts, and more! The Kitchen Buffet is CLOSED on Monday. Lunch • $10.99 Tuesday - Saturday • 11:00 a.m. - 3:00 p.m.
Brunch • $14.99 Sunday • 10:00 a.m. - 3:00 p.m.
Dinner • $15.99 Wednesday - Thursday • 5:00 p.m. - 9:00 p.m. Weekend Dinner • $18.99 Friday & Saturday • 5:00 p.m. - 10:00 p.m.
Sunday Dinner • $15.99 Sunday • 4:00 p.m. - 9:00 p.m.
EASTER BRUNCH BUFFET • $16.99 April 21 • 10:00 a.m. - 3:00 p.m.